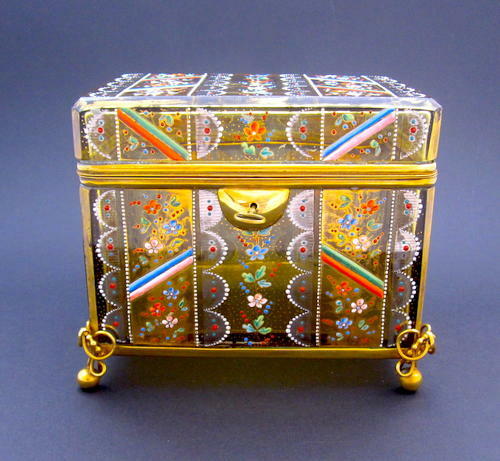 Stunning Large Antique Bohemian MOSER Box Enamelled All Over with Flowers. Fine Dore Bronze Mounts and Ball Feet. Moser Pieces can be Recognised by his Trademark Designs. His Signature Designs are his Use of Applied Glass Acorns; Polychrome Enamelled Oak Leaves, Enamelled Bugs and Applied Grapes Formed from Glass `Jewels'. His other Known Distinguishing Features Included Raised Enamel Birds, Colourful Butterflies and Birds. All Very High Quality .